International, and often derivative, media reports claim single malt Scotch whisky stocks are running out, but the facts tell a different story, writes Becky Paskin. 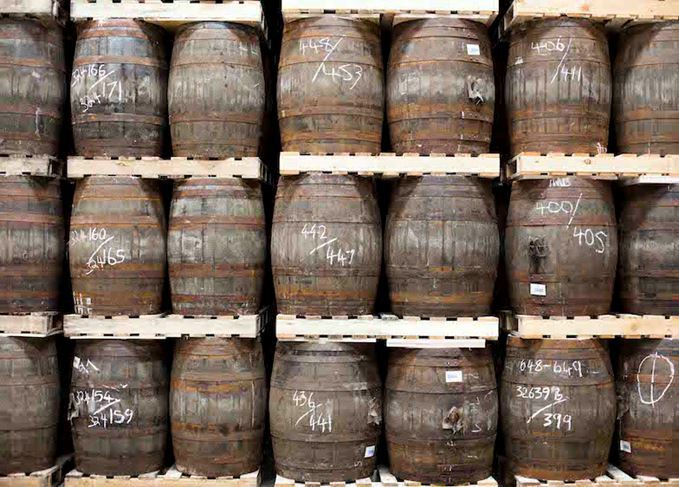 Supply and demand: There are currently 20m casks of Scotch whisky sitting in warehouses, but is that enough? If we’re to believe our friends in the mainstream media, we’re teetering on the verge of a Scotch whisky supply crisis. In recent weeks it’s been widely reported that finding a bottle of ‘good’ single malt Scotch whisky is about to get harder – thanks to Asia’s increasing thirst for a dram – and the situation will only ‘get worse’ over the next 10 years. These are shocking headlines to read for malt lovers, but not exactly reliable when the story in question is based on the opinions of those involved in whisky investment funds, which are likely to benefit from the widespread belief that a shortage is upon us. Prices for mature whisky are indeed increasing, no-age-statement (NAS) expressions are on the rise, it’s becoming harder to source an affordable bottle aged 20 years and above, but is Scotch whisky really running out? It’s time to examine the facts and make an informed opinion. Scotch whisky is a global powerhouse of a category – 95.3m cases of it were sold in 2014 and it accounts for 25% of the UK’s food and drink exports. The majority of Scotch sold is in the form of blends – malt and grain vatted together – but single malt whisky accounts for just 11% of sales. This means the bulk of malt produced is destined for blends in varying proportions. However, the balance between the two is shifting as growing consumer interest in provenance and individual distillery character is encouraging single malt sales, which grew by 5% in 2014, according to International Wine & Spirit Research (IWSR). Where is this demand for single malts coming from? It’s not Asia as these articles would have us believe, but the United States and Europe. According to IWSR data, the US accounts for 20% of global single malt sales, and is growing at a compound annual growth rate (CAGR) of 9.8%. Meanwhile, four of the top 10 malt markets are European, the UK representing the largest share of value sales at $562m in 2014, up 9.6% on the previous year. Diageo, which represents around a quarter of single malt distilleries in Scotland, has seen growth rates of 10% on its single malt portfolio over the past five years, but not necessarily from Asia. Nick Morgan, head of whisky outreach at Diageo, believes media claims that Asia is drinking all the malt is ‘not true as far as us and the market is concerned’. Looking ahead, while Taiwan – the largest single malt market in Asia – is expected to overtake France to become the world’s second largest by 2020 in volume terms, it’s still only expected to sell less than half the amount of single malt consumed by the US. But what about this idea that old single malt Scotch, that destined to carry an age statement of 15-20 years and above, is about to become extinct? Bulk stocks of single malt whisky maturing in Scottish warehouses aged 11 years and above were down by 7% in 2014 to just under 230m litres. Considering there was a total of 1.9bn litres of single malt within those warehouses in 2014, that means just 11.6% is older than 11 years. It’s a shocking figure until you consider that the majority of malt is used relatively young in blends, and that the lion’s share of single malt sales are 10 or 12 years old or younger. Taking single malt’s largest market as an example, the fastest growth in both volume and value by a long way is coming from the more affordable end of the market – the younger malts. According to the Distilled Spirits Council of the United States (Discus), premium malts grew by 80% in volume and 82% in value, far outstripping older whiskies situated in the super-premium category, which grew by 13% and 16% respectively. Diageo claims the premium segment is driven by ‘the ordinary malts drinker in the street’ because of its affordability, and certainly growth within the group’s portfolio is driven by its younger and NAS variants. According to Scotch Whisky Association (SWA) data, between 2010 and 2014 the level of 11-year-old and above single malt in Scotland’s warehouses declined by an average of 6% each year. This suggests a tight squeeze on aged whisky stocks, but the decline isn’t fast enough to eradicate old single malt altogether – particularly with the current level of investment in increasing production rates – on which more later – while 230m litres of aged malt is nothing to be scoffed at. It’s important to bear in mind that the SWA’s figures on maturing stocks are only based on the collective data volunteered by its members, whose distilleries vary in size and popularity. So while some brands lament a small aged inventory, it is less of an issue for others, and not all their stock is necessarily accounted for in their proffered data. While falling stocks of old whisky are certainly having an impact on prices, extreme media examples of the £12,000 price tag now commanded by a bottle of 29-year-old Bowmore Black distilled in 1964 – which originally sold for £80 upon its release in the 1990s – are not directly indicative of distillery stock levels. The popularity of Scotch whisky has grown so significantly over the last 15 years that it has become a luxury – even a sign of wealth and success to some. More recently, the ability to buy and sell old and rare bottles on Internet auction sites has given rise to the perception of Scotch as a commodity to be traded, like art, for investment only. The trend is now so widespread that a relatively rare whisky such as Bowmore Devil’s Cask Batch 1, released for £50 on the High Street in 2014, can sell the next day on an auction site for £100. The result is a dearer retail price in the first instance – why should a producer sell its whisky for half the price someone is willing to pay for it? Diageo’s Morgan believes the demand for these old and rare whiskies is not coming from the everyday malts drinker, but rather from collectors and investors ‘who aren’t drinking whiskies’. ‘It’s not really interest in single malt Scotch that’s the issue going forward, it’s the interest in old whiskies for collectors, investors and speculators, and that didn’t exist five to 10 years ago,’ he says. Distillers have always made it a priority to manage their stocks to maintain a balanced inventory with varying degrees of success – they need both young and old whisky to create a layered, complex vatting, regardless of whether it carries an age statement or not. That means planning ahead and predicting demand 10-20 years into the future is critical, however difficult. The whisky loch of the 1980s meant there was surplus whisky in Scotland’s warehouses, which forced distillers to dial down their output and even close some plants to save on costs. Now, 30-odd years later, there is less 30-year-old whisky than there would have been at the start of the millennium, but producers are planners – and lower stock levels don’t mean single malt is about to run out. Just because there is a growing secondary market of investors and auctioneers purchasing bottles, also doesn’t necessarily mean that distillers are obliged to sell more of their mature stock. Regardless, increasing interest in single malt Scotch whisky has encouraged producers to build new distilleries and expand existing ones as they anticipate future growth. Chivas Brothers opened the £25m Dalmunach distillery in Speyside in 2015 to provide fillings for blends, while an expansion of The Glenlivet is currently under way. Diageo may have temporarily halted its £1bn investment programme into increasing capacity at its sites due to a downturn in demand for blends, but its strategic malt distilleries are all running at full speed to enable it to meet future demand for single malts. David Frost, chief executive of the SWA, says producers understand they have a responsibility to meet future demand of both malts and blends. Ultimately, with around 20m casks of Scotch currently maturing in warehouses across Scotland, there is very slim chance of the world running out of whisky any time soon.